1. Ford made a billion-dollar investment in the Pittsburgh startup, Argo AI. The startup is helping Ford lay the tracks for their pilot program launching in Washington. Argo provides the technological know-how in developing and running the cameras and lidar units, which make the exact measurements using laser beams to map roads, curbs, streetlights, and pedestrians in real-time. The technology takes 3D snapshots of its environment, which are then algorithmically tailored to orient the car. Ford’s servers and vehicle fleet will be stored in the Northeastern section of D.C. where the program is taking off. Initially, all cars will be manned by a safety driver and second engineer. 2. It’s the Wild West for Federal Regulations. The government has been nonchalant about regulating the burgeoning technology. This comes as a surprise to many, especially after the death of a pedestrian hit by an Uber driver. Carmakers and techies have pushed localities and government officials to take a "hands off the wheel" approach in order not to stymie innovation. Presently no federal laws or codes compel autonomous-vehicle companies with any certification or license. Anybody can do it with only a few billion in the bank. 3. Ford is launching their pilot program in more cities than just Washington D.C. The program will also take root in Miami, Detroit, and Pittsburgh. Currently, the program is doing the preliminary work in order for their commercial program throughout the U.S. to take launch in 2021. They have some competition with Google’s Waymo already operating a limited number of driverless vehicles with chaperones in Phoenix, and GM’s Cruise set to launch in San Francisco. 4. Say Hello to New Jobs that will Require New Skills. Mayor Muriel Bowser of D.C. sees the Ford pilot program as a great way to bring new jobs to the city and wants to help residents transition their skills for the changing economy. Argo AI is partnering with the D.C. Infrastructure Academy to prepare local residents for jobs as autonomous vehicle technicians. 5. Business Executives are Preparing for a Huge Change in How Goods are Provided. Ford says it’s now building a driverless-fleet for round the clock autonomous use. Driverless cars will cost consumers an expected $1.00 per mile compared to $2.50 per mile in an Uber, $0.70--1.50 in a personal car, and $0.30 for mass transit. Competitive pricing will make it easier for residents to have fresh food cheaply delivered and company executives are planning on how to incorporate advertising, media, and other services into robo-taxis. While full fleets of driverless cars are still a thing of the future, they’re coming soon as companies lay the groundwork which will steadily bring undoubted change across many industries. So buckle up and let the algorithm take the wheel, autonomous cars are soon coming to a city near you! Want to join a team dedicated to the future of vehicles? 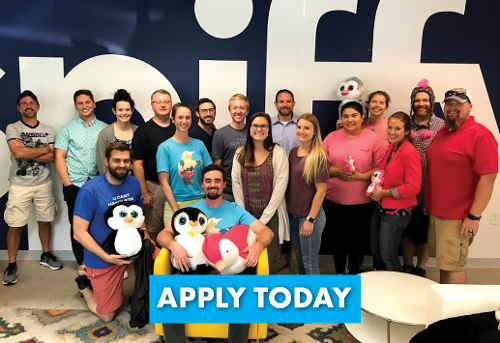 Spiffy is hiring! Click below to learn more and apply today.